The Geektified Blog: Exciting Black Panther Announcement from Marvel Comics! Exciting Black Panther Announcement from Marvel Comics! "BLACK PANTHER: A NATION UNDER OUR FEET – PART FOUR"
Continuing the excitement surrounding Marvel’s celebrated Super Hero T’Challa, the Black Panther, the latest episode of this revolutionary multi-artist hip-hop-inspired video series samples, “Kings” by Kweku Collins. 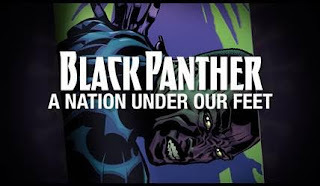 Watch “Black Panther: A Nation Under Our Feet – Part Four” now! Black Panther #5 is available digitally through the Marvel Digital Comic Shop and at all local comic book retailers. To find a comic shop near you, visit www.comicshoplocator.com or call 1-888-comicbook.